If you’ve heard the name Guernica before, it’s likely due to the fact that it was demolished by an air raid in the Spanish Civil War and immortalized by Picasso in his famous painting of the same title. Founded in 1366, the town of Guernica is alive and well once more, becoming a center for peace and having developed into a center for culture and art in the region. Historically, the Tree of Gernika has played an important role as a community meeting point for Juntas Generales (general counsels) since the Middle Ages. Today, the site of the tree along with churches, palaces, homes, museums and parks — some of which did survive the bombings — make this a lively though peaceful Basque town to visit. The Gernika Peace Museum Foundation stands as representation of its current status, and because of the city’s history and deeply embedded symbolism, Guernica is an important piece of Basque culture and identity. Guernica is a short half hour drive from Bilbao. There is also an hourly train from Atxuri station that takes about 50 minutes. 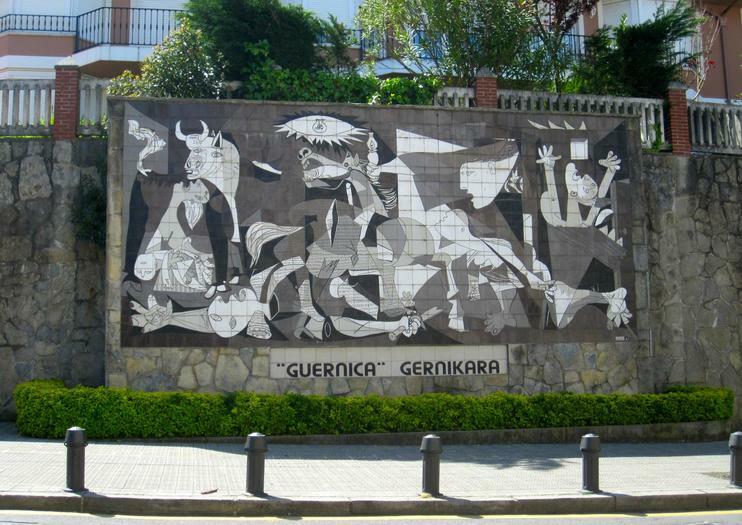 Learn about basque history in the Guernica Peace Museum and it's tragic bombing during the spanish civil war. Enjoy the natural beauty of the landscape all along the Urdaibai Biosphere Reserve (World Heritage Site by the UNESCO), the sights of the famous world class surfing wave in Mundaka, Bermeo fishing village and many more!